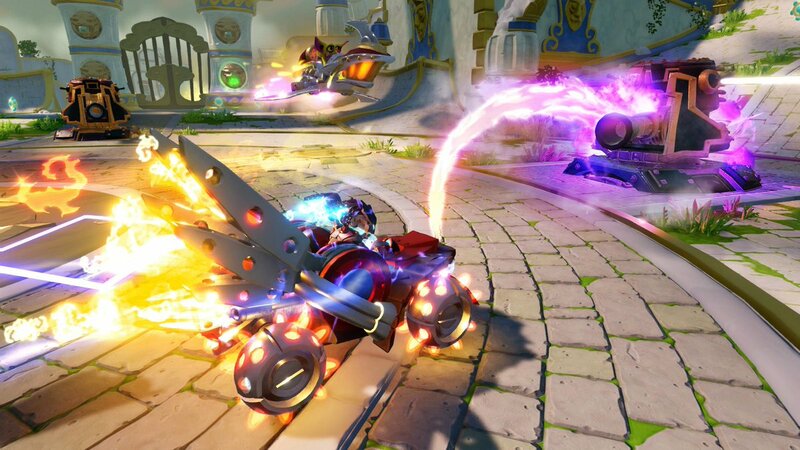 Skylanders is bringing another trailblazing innovation to the #1 kids console franchise with the launch of Skylanders SuperChargers on September 20, 2015 in North America. Activision and the leaders of the toys-to-life category it created, expands upon the franchise's signature gameplay to introduce vehicles-to-life --an entirely new way for fans to experience the magic of Skylands. At the helm of powerful, tricked-out land, sea and sky vehicles, Portal Masters can engage in a high-octane action-adventure video game like never before. Kids can speed across Skylands' roads in vehicular combat, race down roaring rapids and engage in aerial dog fights as they barrel-roll through enemy swarms for the first time. Developed by Vicarious Visions, Skylanders SuperChargers offers a rich story-driven gameplay experience, filled with vehicle-based and on-foot adventures, combat, puzzles, mini games, activities and platforming, set within a variety of all-new compelling environments. "Since first partnering with Activision to bring the original Skylanders Spyro's Adventure to our stores, we have believed whole-heartedly in the magic and innovation of this brand, as well as the company's ability to reimagine and redefine play experiences with the toys-to-life concept," said Richard Barry, Global Chief Merchandising Officer, Toys"R"Us, Inc. "With each new introduction, Activision never disappoints its highly loyal fans of the franchise, and we are thrilled to continue to offer the broadest assortment of all Skylanders merchandise, including the newly introduced Skylanders SuperChargers." To support the game's announcement, motorsports champion Travis Pastrana stars in the Skylanders SuperChargers trailer. Check out Pastrana having a blast with the Skylanders! Fans can pre-order Skylanders SuperChargers Starter Packs beginning on June 3 at select retail destinations worldwide for the suggested retail price of $74.99 in North America, which includes two new Skylanders characters, a first-of-its kind Skylanders vehicle, newly designed Portal of Power+ and the full AAA game. Skylanders SuperChargers will be available on Xbox 360 and Xbox One video game and entertainment systems from Microsoft, PlayStation 3 and PlayStation 4 computer entertainment systems, Nintendo's Wii U system, and a different, unique adventure will be made available on Nintendo's Wii system and the Nintendo 3DS hand-held system. Additionally, the complete Skylanders SuperChargers experience will be available on iPad. The game will be available on September 20 in North America, September 24 in Australia/New Zealand; and on September 25 in Europe.